I am often invited to parties and events. Most of the time, I am focused on the party food when I am out. It's the appearance, the smell, the colors - everything - that draw my attention. Since I started this blog and kept going out and about in NYC, I keep a food diary, detailing the canapés I taste, the hors d'œuvres I see, the snack food I like and the dessert bar I resort for my sugar cravings. And I am thorough and strict. I avoid personal comments, just present the food offered and occasionally the layout. During the last two years, I was invited to hundreds of parties, attended a few and completed more than enough pages of party food notes. It seemed that I had nothing else to add. I thought that I knew everything. Until yesterday where in a cosy event promoting Italian photography and art, there was a snack food I have never seen or eaten. The Deep Fried Olives. Courtesy of Hudson Yards Catering, there were fatty but tasty, small but unique. How far a chef's brain has gone to come up with such an innovation? Most people I know love olives. 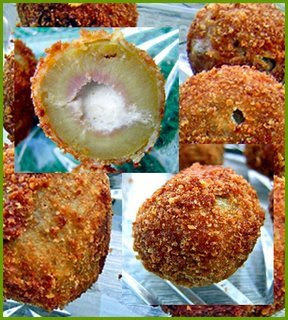 But deep fried olives, I didn't know their existence. The Deep Fried Olives will definitely make an entry in my party food diary. And, as I predict, also in my kitchen. μου άνοιξες την όρεξη. Και το άλλο με το μαλλί της γρίας τρέλλα.